LOL.. I'd like a picture of an astronaut EVA, with spare helmet jamming his Hasselblad inside it. I bet it would look like a greased pig contest.. I haven't found any astro-sociological studies related to the human reaction to the absence of starlight in deep space travel. There are of coarse lots of physiological study and comment on permanent vision problems. So looks like if only a specific group of astronauts that do see stars in flight, may not be able to do so after a couple of weeks. The nasa study says a trip to mars would require 2 years to recover from the zero gravity effects, before returning to earth. A suggestion of yours was that NASA is afraid the absence of visual stars in spaceflight, would affect their funding. They don't pitch it that way. I think manned deep space exploration is all bunk, To me there are some insurmountable physiological problems with human exploration of deep space. In the 60s maybe, They did go with the Holywood style space suits. So there were artistic expectations. But the disappointment of not seeing stars hardly at all till cis lunar space, as Apollo 10 transcripts tell, and only behind the moon when earth shine and Sunlight blocked. Making Holywood and startrek style stars vary disappointing. Even with Hadfields camera magic, I read an interview ( which I have trouble dredging up). He stated he was only trying to recreate what he saw for the earthbound public. The findings relate to an area of theoretical nanophotonics and quantum theory known as the Casimir Effect, a measurable force that exists between objects inside a vacuum caused by the fluctuations of electromagnetic waves. When studied using classical physics, the vacuum would not produce any force on the objects. However, when looked at using quantum field theory,the vacuum is filled with photons, creating a small but potentially significant force on the objects. I thought of this post in reading this article. Do you think it is compatible with aetheric medium? I kinds stopped reading when they said that "photons were slowing things down". Photons add energy. Removing energy slows things down. Webbman wrote: I kinds stopped reading when they said that "photons were slowing things down". Photons add energy. Removing energy slows things down. When light separates in a prism, isn't that slowing down ? You indicated light travels slower in the Suns plasmasphere, so, just hoping you might expand on that. Earlier in this unit, the concept of optical density was introduced. Different materials are distinguished from each other by their different optical densities. The optical density is simply a measure of the tendency of a material to slow down light as it travels through it. didn't say the light was slowing down. it said the nanoparticle slowed down due to photons as a justification for some proposed new lateral force. I am still confused what an ND filter is going to do for you, its use is reducing the intensity of the visual spectrum. Seems all it does is reduce light saturation..
By saying its needed and as per "hear say" that you reporting, that all astronomers will agree its needed to view the sun properly... it more falsifies than verifies your thinking. Sorry, the edit timed out on my post when I saw my reading comprehension error. At least if you are within the atmosphere, if it wasn't for that Gold visor, you would go blind. Did the Apollo modules have Gold coated Windows? Let me restate part of that, I meant plasmasphere I think. I consider the ISS to be within that. But anyway..
Do they ever open the ISS Cupola when facing the Sun? Or only when it's safe? 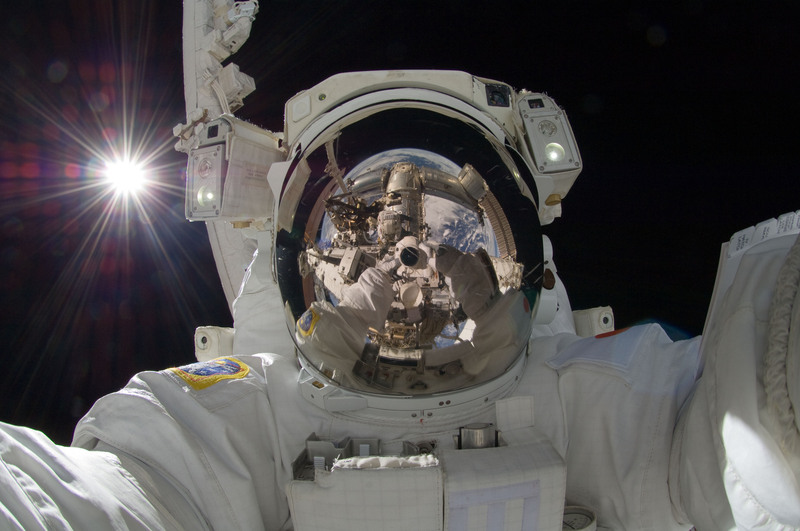 Based on Astronaut equipment, without the Gold Shield, to look at the Sun would burn your eyes out from invisible IR. But all the Windows on space capsules I see have no shielding at all. I feel that visible light from Stars outside a bodies plasma sphere, or like the Van Allen Belt maybe, go away. Because the 'light' of space, through the inter-planetary, and inter-galactic soup of stellar plasma, does not contain Visible light wavelengths. So for humans traveling between bodies, in this region, do really see a massive void of nothing. Except for reflections and other events that disturb the solar and galactic 'winds'. Cargo wrote: Do they ever open the ISS Cupola when facing the Sun? Or only when it's safe? might go back and do some fact checking. Astronaut sun shields? You might site the burn your eyes assumption. probably a little quicker than here on earth. I quote eye witness accounts of stars seen in cis lunar space falsifying your idea. And Sun light illuminating EVA s pictures of Sun 16mm movies 70 miles above the lunar surface. obviously the light is still there or we wouldn't see it on the earth but it makes sense that it might look a little different without the lens of the earths atmosphere. my feeling is that when the sun is shining directly most everything else is invisible to you, but when blocked you can see it more clearly. Same as night and day here on the earth. on the earth during the day you cant see stars because of light interactions with the atmosphere, which are not present in the night, but the atmosphere is nonexistant up there so I imagine the mechanism is just an overwhelming effect that would require filters. so in a way you could all be right. such sound thinking. but one item..
without the lens of the earths atmosphere. I think a lot of people think the atmoshere does this. But if you use a finger nail out streched, next to the moon at moon rise which looks larger, then compare the same method at its zenith. it will look the same size with your finger nail as a forground refference. having no forground refference causes the optical illusion. Here's one non-official reference I was looking at. The outer sun visor is made from a polycarbonate plastic and coated with a thin layer of gold. This combination gives complete protection to the astronaut. Why? Your eyes can focus both visible and near IR light onto your retina equally well. Your eye has visible receptors but not IR ones. When intense visible light hits these receptors, the receptors transmit information letting you know that this is painful and will cause damage if you don’t either close them or look away. On the other hand, without IR receptors, you wouldn’t realize that your eye was being “burned” with an intense IR source. Therefore, astronauts need IR protection from intense sunlight above the earth atmosphere. The windows each consist of inner and outer panes. out most infrared and all ultraviolet rays. So with either their American Aviator sunglasses and/or their visors, they should have been able to look at the Sun and describe how it appeared, though obviously the colour would not be correct. Of all the experiments performed, no time was allotted for observation or photography of the Sun while in cislunar space, just plain ridiculous. Even from orbit, Skylab similarly had not one experiment to observe the Sun with a camera, though they had a UV and x-ray experiments on the external Apollo Telescope mount. And as usual, they took no solar filters. This is the smoking gun when it comes to the visibility of the Sun from space, the fact that they will not even take them out there, or if they do, as with Petit, they are looking towards Earth, through the atmosphere, and not away from Earth. There will never be photos of the Sun taken from space, time will prove me right, though I won't be around when it is finally tested. Civilians will never go beyond low Earth orbit, mark my words. The Sun is not what we are told it is of course, and I believe the Ancients knew far better its true nature. To me it is an opto-electro-magnetic machine at the physical level, but it also has metaphysical properties, is the generator of the Cosmic Consciousness, though not conscious in itself, and we are all intimately connected to that consciousness if we can learn to quieten what we think is our personal consciousness, but which is really the Ego that arises as we acquire language and are programmed by our education and environment. Turn off the Ego, tune in to the Sun for the real truth about itself.